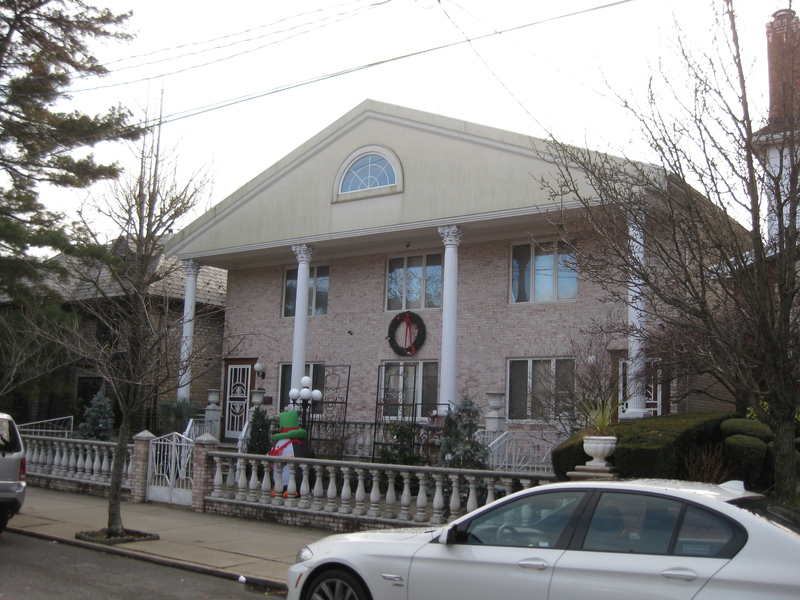 Christmas 2012 in Bay Ridge and Dyker Heights | What Can I Say ? Well, the Mayans didn’t get me, but some sort of flu-like ague that settled into my chest and sinuses on the 15th. of December decided to stick around (literally) through the week that I was in Brooklyn. It hadn’t been debilitating; my energy never flagged, the worst of the attack usually only lasting a day or so, but then I get to slog through a couple of weeks with a stuffed head, ears and chest. It could be worse, so I’m not complaining. 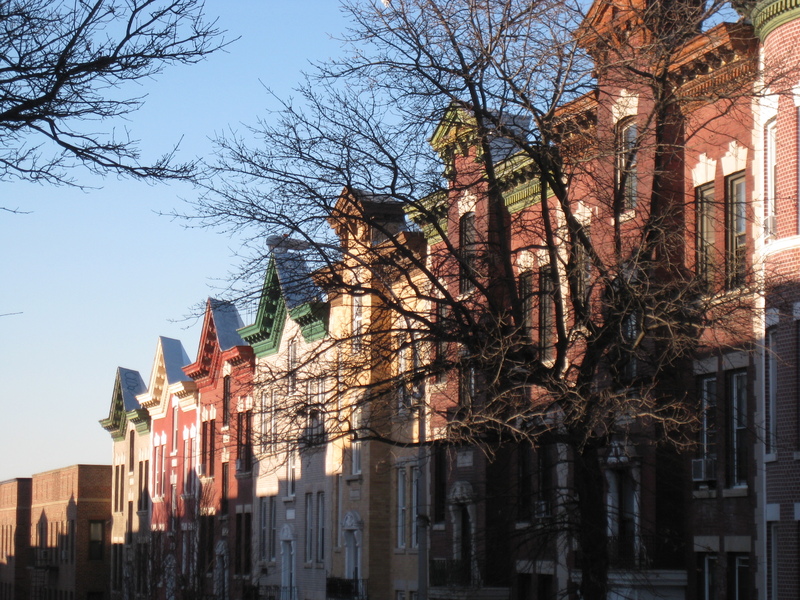 It was cold in Brooklyn, like in the 30s– just this side of freezing, but cold enough to erase all the green from the Bay Ridge / Dyker Heights landscape, rendering everything bleak. You know it’s temporary, though, and soon the gardens on the block (that haven’t yet been replaced with garages or parking slabs) will erupt again with bushes and flowers, the trees leafy and full. Cold weather used to send me into asthmatic paroxysms, but that didn’t happen this Christmas. Mom and I took a walk over to Fifth Avenue to have burgers and fries at a little diner-y place, and I felt good enough to go for yet another walk after we got back home. I didn’t have to use my puffer at all, though a shot of generic Dayquil every few hours was keeping me feeling pretty good. The puffer, incidentally, has been taken off the market because it employs fluorocarbons to blast the life-saving medicine into my lungs. And we have learned that fluorocarbons erode the atmosphere. My position is: the fluorocarbons don’t leave my body– I can FEEL them– so what’s the nag? The nag is that the drug companies want asthmatics to have to troop to their doctors for (expensive) consultations and (expensive) prescriptions. The screwing of the wheezing public continues, step by step. Anyway. 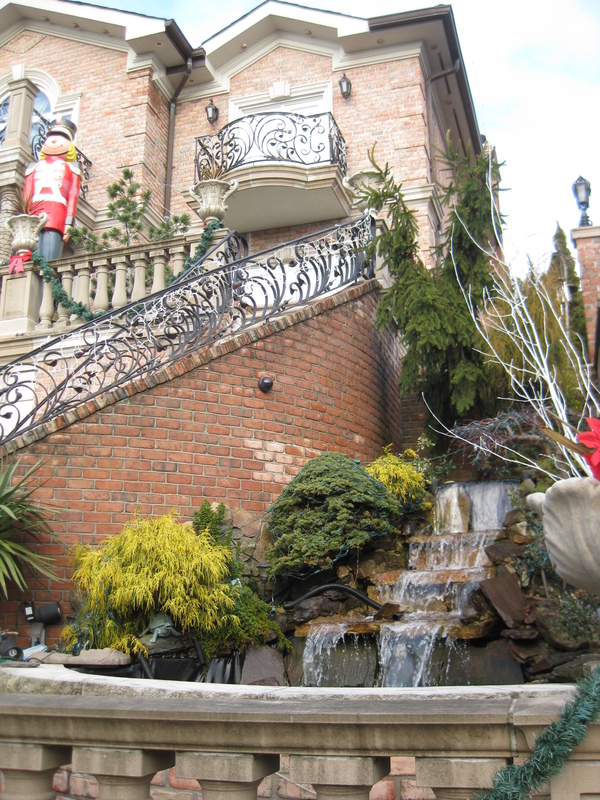 Dyker Heights is still very Italian, and, except for a couple of shopping streets, composed mainly of single or duplex houses. Some of the single homes are very, very grand. This is because the owners of these houses, who are now mostly well-to-do but still desiring to live near their business interests, have invested their money in their immediate property. Italians being Italians, the more grand a home is, the better chance you have of showing the world that you’ve Made It Big. Corinthian columns, gardens, statues, fountains, pergolas, ornate dentilled cornices and elaborate porticos can often ALL be found gracing ONE dwelling, often half of a duplex. The Puttanescas may be content with their gray shingled two-story, but the attached Cazzolungho home will be seen erupting with the stylistic architectural excesses of at least seven historic periods. I got to see these homes up close because I had to go to “the Italian store” for Christmas Day comestibles. 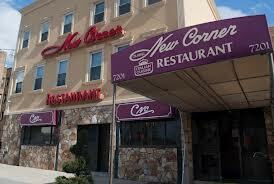 As the plans stood at the time, Christmas Eve was going to be me, Mom and my brother Tony at Colandrea’s New Corner Restaurant (just down the block from Mom’s house), while Christmas Day was going to be spent at my sister Gina’s house in Staten Island. We were going to bring our end of the bargain– pastries, and a stuffed escarole. Do you know what a stuffed escarole is? You buy a bunch of escarole; you separate each leaf and wash it because dirt collects down near the base of the leaves; you arrange the leaves in an overlapping sunburst form in a pan; and then you place a large chunk of stuffing in the center of these leaves. Then you draw up all the leaves, creating a ball shape, and then, finally, you bind the whole thing with thread so that it can be cooked in its pan. Then you load it in your brother Tony’s car and bring it to Gina’s house on Staten Island. To Scaturro’s Italian grocery store I went, walking all the way in the bracing cold air, thanking God that it wasn’t windy. Mom lives between 8th. Avenue and Fort Hamilton Parkway, a long block; Scaturro’s is on 11th. Avenue, and from Fort Hamilton Parkway to Eleventh Avenue is two long blocks, and then I had to turn left and go nine short blocks to 63rd. Street. It wasn’t bad. Walking gave me up-close glimpses of the neighborhood, and I realized that our latest crop of immigrants has decided that their front porches and area ways can be used as storage for all manner of plastic pails, cardboard boxes, hanks of rope, unidentifiable things made of metal, dead plants, and garbage pails. Incredible! All of these things used to be kept in the basement, but now Grandma is living in the basement. Hence the scenery. I found the produce section and noticed someone examining the offerings: tall, sandy-haired, be-scarved, WASPy. What was he doing in this neighborhood? “Which ones are escarole?” I asked the Yuppie interloper, because really, I had no idea; all that greenery looked the same to me. And he shrugged because he hadn’t yet seen Martha Stewart’s episode about Italian vegetables, and then we both realized that wide rubber bands twisted around the bases of the greens happened to identify them. ESCAROLE. PARSLEY. BASIL. I took the largest bunch of ESCAROLE I could find and placed it in my basket. I also had a few other things to get, like the aforementioned rolls. “How long you staying with me? Seven days? Okay, get seven sandwich rolls with the seeds for lunch, but not sesame. And don’t get the long rolls, get the short ones” When I’m out of rolls, I guess I have to get back on the plane. I got back home with my groceries, passing the same plastic pails and the same cardboard boxes. I loaded everything onto the butcher block table, scarred with the knife dents that my Dad made when he demanded order from us rotten children by banging his cutlery along its edge. 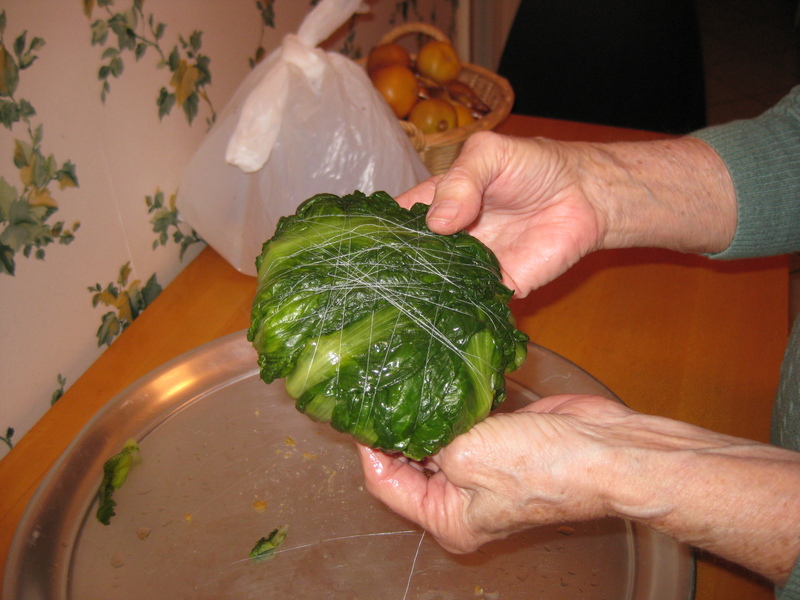 Mom inspected the escarole minutely. 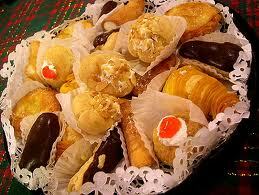 Also on my list was an injunction to buy PASTRIES, but NOT NOW; GET THEM LATER WHEN TONY CAN DRIVE YOU. It so happens that there are no longer any Italian pastry shops on Fort Hamilton Parkway where you can buy large pastries. So, on Christmas Eve, as soon as Tony got to the house, we got back in his car and drove to the Mona Lisa bakery on 86th. street, just south of Dyker Beach Park and next to Mezcal’s Mexican Restaurant. We lined up with all the other Italians buying emergency Christmas Eve pastry. I listened in on the buyers’ conversations; mainly they were speaking in Neapolitan and Sicilian dialects, and so the Tuscan half of my being quivered and snickered with derision. Tony and I went to Mezcal’s after buying pastries, rebonding over a few straight shots of Sambuca. My brother is very funny; I love that guy. And then we drove back home. Tony and Mom and I celebrated our traditional Christmas Eve at Colandrea’s New Corner Italian Restaurant, conveniently located down the block from us; we didn’t even have to find a parking space, always a celebration in my house. We had the five o’clock seating, which is a good thing, believe me; by eight o’clock all the waiters are exhausted from having to deal with beehived aunts from Bensonhurst and Long Island. We chose from their very nice menu and then waited for my father’s cousins to appear. Like the Magi, they appear at New Corner annually, just after we do. Actually, they’re cousins-in-law: two of my father’s departed cousins’ husbands, a son of one of them, and one of the husband’s sisters. We’re very close; we see them once a year as long as we eat at New Corner. At one point during our meal we noticed bright lights shining from their table. It turned out that Joe’s sister, who has big, beautiful, blue owl eyes like her brother Joe, was reading her menu with the aid of magnifying eyeglasses AND an LED flashlight. How dark could it be?! I had to go over and tell them that the resultant reflection was burning out my retinas– and what exactly were they doing, spotting planes? Christmas Day wasn’t spent with my sister Gina according to plan, as she had an emergency and spent a few days in the hospital. (She’s fine; she’s tough as nails and thick as oak.) And there we were, loaded down with a box of pastries AND a stuffed escarole. What to do? We decided we would await instructions from her family, but God forbid we miss a meal, so we ended up having Christmas dinner at– did you guess it?– Mezcal’s Mexican Restaurant. It was just about the only place open in that section of Brooklyn, and they made us reserve a table for two p.m. They were very nice. They played Christmas music over the speakers for us, delighting in repeating “Feliz Navidad” until we memorized it. We were the only three people in the place until three p.m., when two more people showed up. “They must be the three o’clock seating!” I exclaimed, because I had had two Coronas already. We made fun of the travel posters– “See Puerta Vallarta and die!”– and the holiday lights strung with plastic green and red peppers, and finally headed back home in the quiet cold of Tony’s car. The rest of the week, I ran errands, walked a bit in the cold, and kept tabs on Gina’s progress. I also watched a lot of TV that I normally wouldn’t watch, let alone know what it was that I was watching. I just don’t watch a lot of TV, but there I’d be in Mom’s living room, listening to her change channels with the clicker. “You’re such a snob. Why can’t you just relax? Here, pick something.” And she would start clicking through the ten thousand cable stations she has on her state-of-the-art system. “That looks good,” I would say when Bea Arthur or Norma Shearer ghosted across the screen. She’d eventually settle on a gory movie or show which usually involved severed limbs, decapitated teenagers, Nazi zombies, exhumations of murder victims, or nature films with names like “Survival In the Wild” featuring close-ups of ants devouring one another. “I just like to figure out the special effects in the slasher movies,” she’d admit, “but those ants are pretty damned real, right?” In another life she would have made an excellent forensics expert or movie make-up artist. I walked one day far afield, thirty-six blocks east and four avenues north to Green-Wood cemetery where my father is. 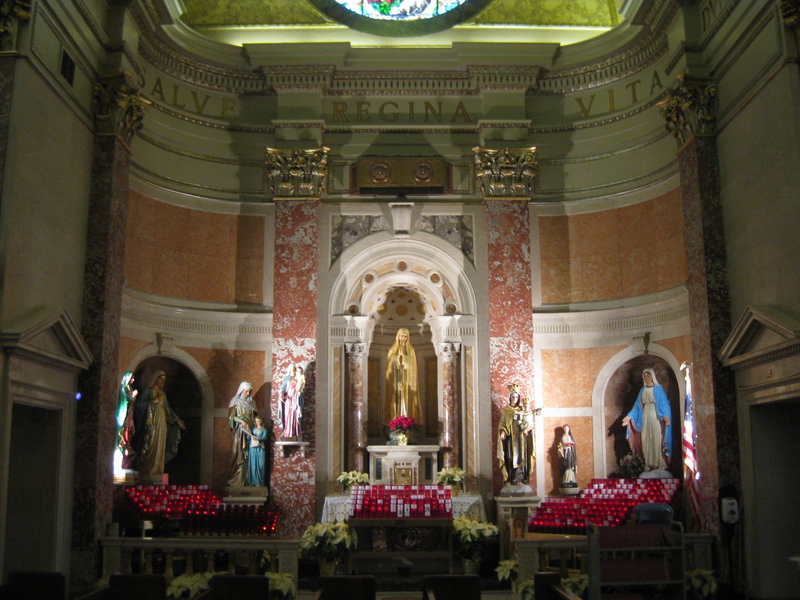 He’s not in the hilly area where the big mausoleums and monuments are; he’s in an area that I refer to as “the Flats,” close to the landscapers’ buildings, in view of the side street brownstones and the traffic along Fourth Avenue. He probably loves it. I called Mom from the gravesite and told her that I was visiting Dad, and that he said hello. (You never know.) I brushed away some of the scattered leaves and bits of plastic shrubbery that had blown onto his stone from other sites, thinking, as always, how much he would have appreciated the Mexican restaurant, Joe’s sister’s flashlight, and the determined people lined up for pastries. I thought of him the day I stopped in Regina Pacis on the way back from Scaturro’s, just to marvel at that mini-Vatican and say a small prayer. I know how much he would have appreciated all of this craziness, especially because he loved Christmas so much and everything that went along with it. Especially the stuffed escarole. And he helps me appreciate it all even more. 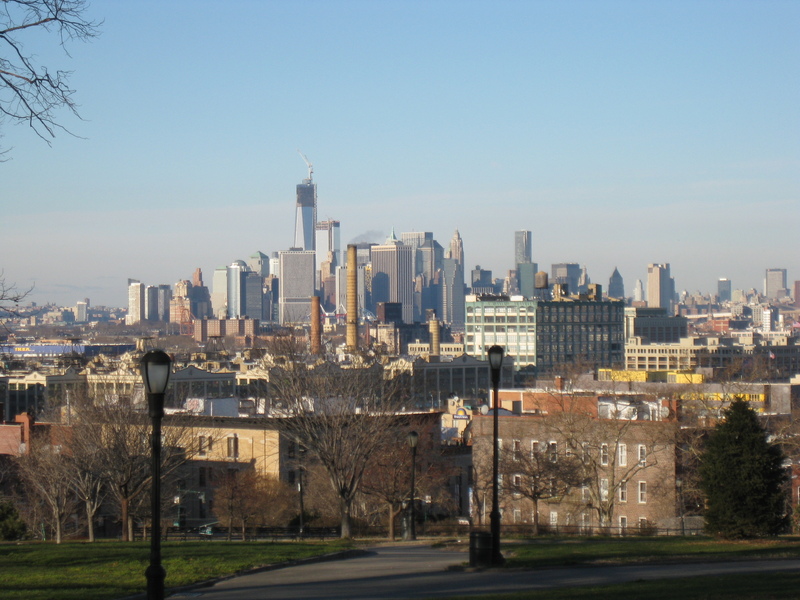 The Manhattan skyline from Sunset park, just east of Green-Wood Cemetery. It’s great how you can see the humor in your own culture, and that you’re fascinated by other cultures (my Midwesternism, the Irish, the Mormons…) When did you realize your addiction? Thank you — we just had the annual Gitto gathering at New Corners!